Wild Roses tend to stir ones thoughts towards medieval times of Knights, Kings, Queens, Princes and Princesses, as many of them date back well into our history. The botanical term for them is “Species Roses.” Though this term does not conjure up the same emotions, it is the classification where you will find them listed or placed for sale in rose catalogs and at nurseries. Species roses are naturally growing shrubs that occur in the environment with no help at all from man. Species Roses are single bloomers with 5 petals, almost all of them are pink with a few whites and reds, and a few that go towards the yellow coloration. They are all own root roses which means they grow upon their own root systems without any grafting, as is done by man to help some of the modern roses grow well in varying climatic conditions. Species or wild roses are the roses from which all others we have today were bred, thus they do hold a special place in the mind and heart of any Rosarian. Species or Wild Roses tend to thrive on neglect and tend to be exceptionally hardy. These tough roses will grow in just about any soil conditions. At least one will even do very well in wet soils. These wonderful roses will produce beautiful rose hips that carry over into winter and provide food for the birds if left on the bushes. When planting them in your rose beds, gardens, or general landscape, do not crowd them in. Give them room to expand and grow into their natural states. Crowding them, like with other rosebushes, tends to cut down on airflow through and around the bushes, which opens them up to disease problems. Since they are own root bushes they can die way down in the winter and what comes up from the root will still be the same wonderful rose. When deciding to add one or several of the Species Roses to your gardens, keep in mind that they do not bloom all season like many of the modern roses will. These roses will bloom in spring and early summer and then are done blooming as they begin setting those wonderful multi-use rose hips. To obtain a rosebush that is very close to its wild rose beginnings, look for a rosebush aptly named “Nearly Wild.” She offers the same beauty, charm, low maintenance, and toughness of a true wild rose but has the added magical kiss of repeat blooming. Once their root systems are established in their new homes, these tough rosebushes will thrive with a minimum of care. Deadheading (removal of old blooms) them really is not necessary and will cut down or eliminate the wonderful rose hips they produce. They can be pruned a bit to maintain a desired shape, again be careful how much of this you do if you want those beautiful rose hips later! One of the wonderful wild roses found here in my home state of Colorado is Rosa woodsii, which grows to 3 or 4 feet tall. 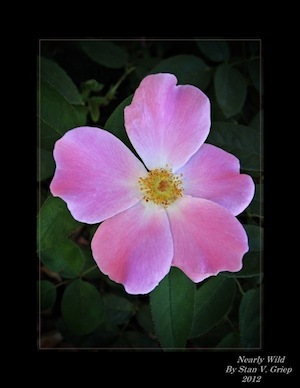 She has pretty pink fragrant blooms and is listed as a drought resistant rosebush. She grows happily throughout the mountain west of the United States. "Use Gro-Rich Rose and Perennial Food for the Best Bloom Smiles in Your Gardens!!"